a symbol that is found in every culture. and in the random patterns of branches and trees. even associated in renaissance paintings with Christ. with the perception of spirit. I have developed the symbol made of the branches of the apple tree. The branches are woven as a sign of eternity. An apple blossom on the side: the promise of fulfillment. it is up to the individual to choose to be “right minded” when choosing a path. a term for fellowship or structured society. phone lines and other forms of communication. with a clear mind and an open heart. reserving nothing that would inhibit health and well being. is the most difficult of efforts. and respecting another position without compromising one’s own ethic. able to put aside petty squabbles and differences. for the Radiant Beings that we are. Pentacles did not necessarily mean “Five pointed star” as it does now. They simply meant: Magical talisman inscribed with any symbol or character. pentacles signify Matter or the Material World. and left the rest to be listed under other categories. More information may be found at Amulets by Merlin custom page. The image of a Stag is a powerful one: it is seen in art, heard of in song, stories and strikes a spark of racial memory which seems to reach back for generations. When one sees an outline of a stag, one gets a sense of freedom, wilderness and awe. Like the Buffalo in the Native American mid planes culture, the Stag was revered as Sacred among the Celts: offering food, tools, clothing and more for the conscious hunter. To bring down a deer meant the Household would be able to eat and live well for some time. For this and many other reasons, the image of Hern lived in the hearts and minds of the Celts for many generations. The first mention in literature if Hern (or Herne) is in Shakespeare’s “The Merry wives of Windsor”, however many ascribe the idea of Hern to a much earlier time. A “ghost” who walks the Woods of Windsor Forest with a great rack of horns. In the relatively new movement of Neo-Paganism, Hern’s Image has been re-awakened; there is a great deal of tribute to Hern in writings, both in fiction and tomes of Celtic Heritage. 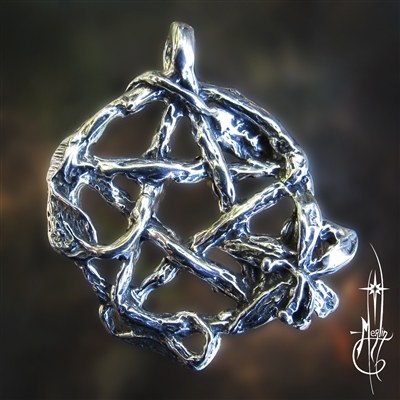 To celebrate the Neo-Pagan view, I have created the Hern’s Pentacle Amulet. 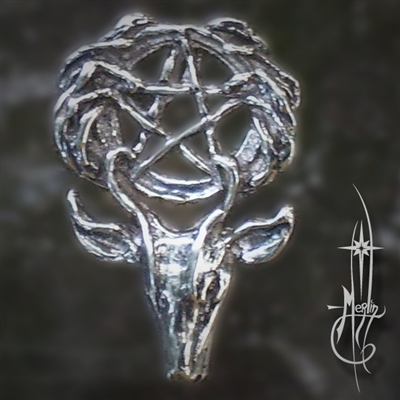 This combines the image of a stag head whose rack of horn embraces a pentacle. 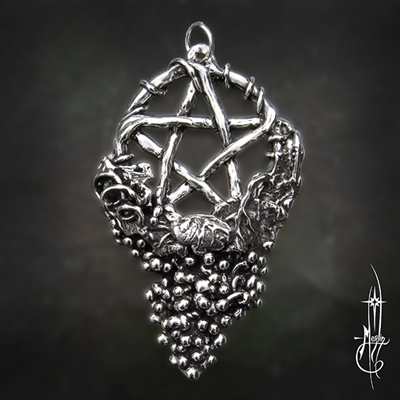 The bail is hidden behind the pentacle to give the amulet a sense of “floating” on your chain or cord. In previous articles I described the Pentacle in detail. Basally the Pentacle is a common shape in nature which was replicated in art and Symbology for centuries. In early art it gained significance and represented balance, strength, endurance and that which is sacred to people everywhere. Only in the recent century has it been tarnished by those who do not understand Symbology and it is mistaken for other things. Small Pentacle with Moon Stone. In celebration of this beautiful shape, I have made several interpretations of this star, some extremely ornate. In this version I have created the Pentacle in it’s most basic shape: a woven five pointed star set into a circle. In the center I have placed a moon stone, a mineral which seems to be solidified moon light: the Romans and Greeks associated Moonstone with their lunar gods and goddesses. 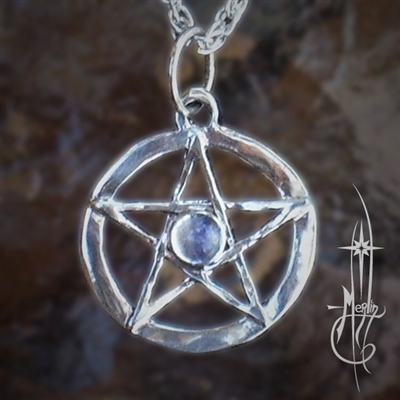 This tiny Pentacle with Moon Stone is sleek and sturdy for years of wear. The moon stone is set in a bezel setting for comfort and security. 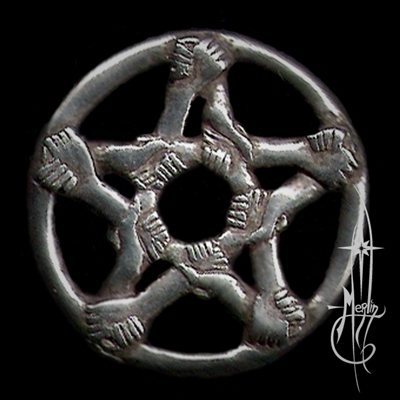 To learn more about this amulet, lease visit my web page featuring the Small Pentacle with Moon Stone. If you cannot find the Pentacle you are looking for, have no fear. I can create your design by way of your drawings or description. More information may be found at Amulets by Merlin Custom Page.